Probably meant “a natural pattern”? Nordic countries. Horrible here, 248K, that’s 446 in Fahrenheits !!!11! Must be climate change!!!1! Mark from the Midwest wonders if he is just acting like another wacked-out conspiracy theorist. Anthony, I’ve been watching the drought maps from University of Nebraska, and in many spots in Northen California and Eastern Oregon the change, (or lack of change), on the map doesn’t seem consistent with the rainfall totals for October through December. Is it possible that local officials are under-reporting ground moisture in order to milk the Federal disaster relief coffers, or am I just another wacked-out conspiracy theorist? The maps are probably not only based on rain fall. The map probably also includes soil moisture and reservoir levels. While Oregon and California now have normal to above normal mountain snow fall, very little of that water has appeared in the reservoirs yet because most is still frozen or has been absorbed by the dry ground. At least one larger reservoir near Francisco has actually lost water in the last month. That reservoir only get water from rain. So the likely explanation there is that the ground is soaking up all the water before it gets to the reservoir. the weather forecasters are constantly reminding people in California that it will take years to erase the accumulated water deficit. As of this morning, Jan 7th, Redding CA is sitting at 97% of normal.I live just east of Redding and in hte mountains and I’m running a bit ahead of normal in terms of rain/water but behind normal in terms of snow. Lake Shasta, the largest lake in CA is about 145 feet below the full level at 50% of normal for this time of the year and 30% of capacity overall. Trinity lake, the third largest lake in CA is sitting at 20 % of capacity and 30% of normal. Trinity depends more on snow melt to fill up where as Shasta gets filled up mostly from run off. As of this morning Shasta is 438,926 acre feet below what it was last year at this time while Trinity is 323,957 acre feet behind last year at this time. Sooooo, in other words, all the liberals in CaliPornia are extra stupid !!! It’s climate change, Jim, and just as we know it. Here on the southern San Francisco peninsula, none of the promised thunderstorms showed up. Disappointing, but there was a bonus non-appearance of power outages. I checked the weather forecast several times a day over the last few days. It literally changed hour to hour. Predictions of rain then no rain, Thunderstorms then no thunderstorms. Rain Thursday and Friday, then not. It seems that when the weather systems are varied and strongly dynamic, the weather models become less reliable. This implies that the ostensible reliability of weather models for 3-7 day predictions rests more on the linear translation of the weather systems than on the physical accuracy of the model. There was a successful anchovy catch this year. Therefore, by definition, there has been no El Nino. The fact that scientists have come up with a metric for SSTs in virtual boxes in the central Pacific does not appear to affect the anchovies. This means that the historic El Nino and La Nina records based on anchovies cannot be pasted onto the NOAA/NASA SST series – they are obviously different events. The catch might have been successful, but the quota was halved from an already low previous quota, because the numbers of anchovies were way down. Even as El Ninos go this is pretty much a squib so far. A couple systems early in the current Zonal Flow episode were a bit juicy but yesterday’s front was pretty weak. The ones prog’ed for this weekend and next week look even weaker. Looking at Squall the prog for the jet takes it into a split out at 120 hrs and the northern branch goes meridianal. Still no real Pinneapple Express events, the fronts are coming from the Bering Sea. Richard's favourite extreme weather event was a big flood back in 1862. He complains that no-one is interested in talking about it. Every time I read some moronic article about how powerful this El Nino is, and just how things are so much worse than ever before, I can’t help but tell them about the Great Flood of 1862, which apparently was not El Nino related and occurred decades before anthropogenic CO2 started “causing” severe weather never before seen in California. Pat Frank must have done something to piss off the weather gods because we've got 2 inches sitting in our rain gauge from midweek and had received 6 inches more since Christmas Eve. We're probably less than 20 miles from him and not in the foothills. Pointless aside: I guess it's a quirk of Aussie English, but we don't tend to use the adjectival form "Californian" in that way, we'll say "California drought" or use the possessive form, "California's Governor, Jerry Brown". A person is a Californian. A object can *be* Californian. So much misinformation about El Nino out there... whether its the media calling it a series of storms or people thinking that we should be getting atmospheric rivers for the next three months (californian reporting in). El Nino does not favor AR events, the zonal flow of the subtropical jet serves as a conveyor belt of mid latitude storms and escorts them into the west coast. the stronger the el nino, the stronger the sub tropical jet. this also cuts off the pineapple connection that we often see associated with ARs in california (that is just one kind of AR), as the moisture cannot cut through the jet. The end result is more consistent rainy days, and medium sized storms (not to preclude the possibility, just less likely) rolling through often. End result is a lot of accumulation, and hopefully not all an all at once epic flood that just washes out to sea. Currently the STJ is battling it out with a ridge over baja that is pushing the storms more north than a typical el nino episode, with central, northern california and the PNW benefiting the most. Rest assured that the STJ will win out eventually and, as demonstrated last week, southern california will be above normal precipitation as well. 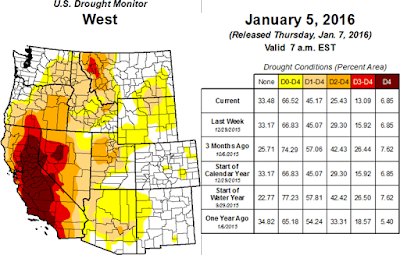 in such a dry climate, just a few moderate to large events put us well over the top. 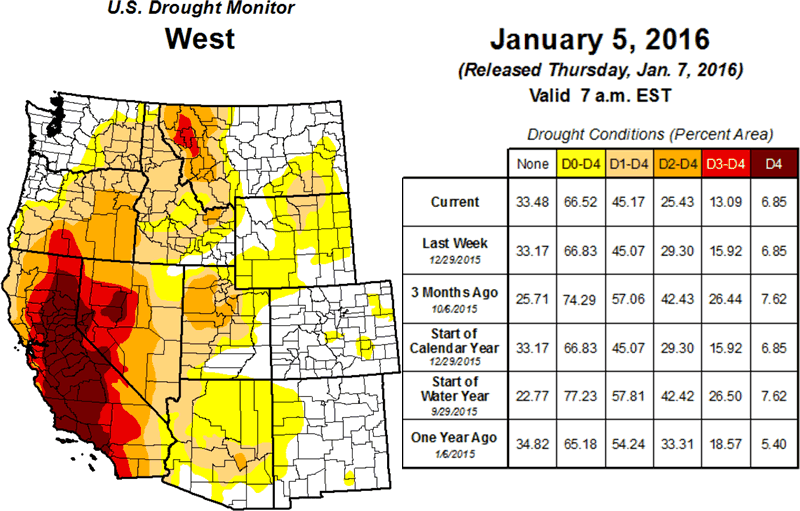 The drought is another concern all together, and it WILL take YEARS to get out of it, and the land will never fully recover where the aquifers have been pumped dry, collapsing the matrix that allowed water storage in the first place. land subsistence is a direct result of this.